Civil services day observed on April 21 every year is according to the government “an occasion for the civil servants to rededicate themselves to the cause of citizens and renew their commitment to public service and excellence in work”. On this particular day in 1947, Sardar Vallabhbhai Patel, expressing his thoughts to the first batch of civil servants, pressed on the privilege that these new civil servants will not be working and taking instructions of “foreign masters” and that they will now have the satisfaction of taking orders from and working for “fellow Indians”. After almost seven decades, the narrative has changed. Indians have enjoyed excessive freedom to the extent that in many cases dissent seems to be an act of mere imitation undertaken to achieve vested interests of a particular group, community or political party. There are no more foreign masters but there are politicians who have the ability to act as foreign masters to accomplish their agendas. In the middle of all the chaos, governance is lost in the lieu of projection and electoral results and civil servants seem to be the last species left on which the most important responsibility of running the nation lies. Young Indians stress too much on becoming something rather than doing something. Is becoming a civil servant also part of this romantic notion of the middle class families?? According to a rough estimate, on an average from all the applications received, only 0.1% to 0.3% of the population make it to this prestigious position. This speaks volumes about the ability of the selected individuals. But the intention to become a civil servant should only be influenced by the passion to make a change and take up the responsibility which is often ignored by armchair intellectuals. In fact, this serves as only one of the reasons for pursuing a career in the public services. We have gone through one of the detrimental transitions of being an inward looking society to an outward looking one. Civil services promises a lucrative position in the government, power, prestige and respect which comes from the clearing the sought after exam and acquiring a prestigious position. Most importantly, it provides a sense of security to an individual, an integral aspect of this collective dream nurtured by a cautious society. But in the desire of achieving this, individuals, forget that “with great power comes great responsibility”. The notion of governance has changed drastically since independence where previously, the focus was on the building institutions that foster high values of integrity and accountability. The literacy rate in India has increased from 18.33% in 1951 to 74.04% in 2011. Thus, there is an opportunity to serve citizens who are not only literate but also more vigilant and aware of their entitlements. The challenge is no longer seen only in terms of alleviating poverty and providing world class public services but to also to seek solutions to specific new age problems like rapid urbanisation and climate change. Are we training our civil servants to cope up with present day crisis? Or we do follow the age old adage of “Jack of all Trades” for all our civil servants. Little wonder then that many of our bureaucrats feel smug owing to this tag of being “panacea provider that ails society”! 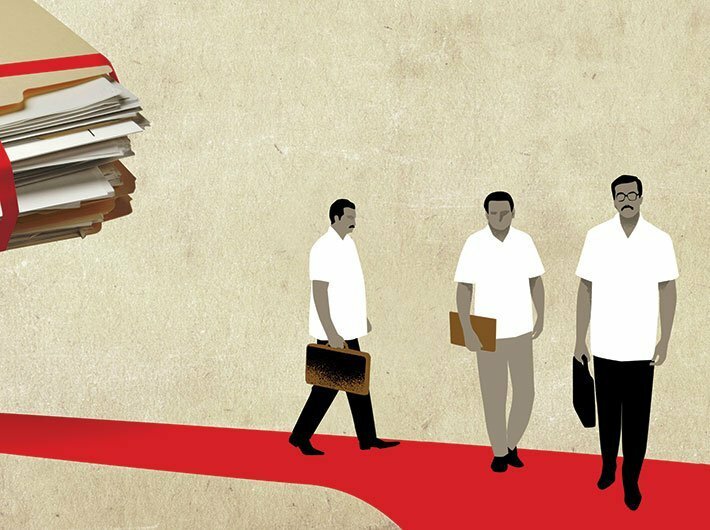 It is time that the administration as a whole entity realizes that bureaucrats at high levels of governance need to have the required specialisation based on their educational background and past experience. This can be one of the more concrete ways not only to acknowledge the need of going into detail to provide answers to critical problems but also to execute timely solutions. Until this happens, the dependability of the administration on external agents for problem solving will only grow by leaps and bounds in near future. An important question that has always lingered around administration class is morality of the civil servants. When we as a system place so much of faith on one individual, there are ample opportunities to use the same power to fill up pockets. The case of Arvind and Tinoo Joshi of the 1979 batch of Madhya Pradesh cadre proves efficiently how certain bureaucrats have the uncanny ability to acquire disproportionate wealth. Most corruption cases or scams done under the purview of bureaucrats are a consequence of how their bosses (politicians) have often spread the plague of self interest in the system. The problem here is that the idea of self-interest is perceived totally differently from the welfare of the society. The system functions in such a way that any wise officer is bound to face severe pressure to lower her/his standards of integrity and adjust and/accommodate for the sake of surviving within the system. Often, these civil servants are let down by their own colleagues who have made a name for themselves in the corridors of power for being numb to all the wrong doings. On the other hand, there have been brave officers like Narendra Kumar, an IPS officer of the 2009 batch who was serving as sub divisional officer at Banmore, set an example of his dedication by giving up his life fighting against sand mafias in Madhya Pradesh. The need of the hour is to embed the services with assertive individuals who remain steadfastly committed to the cause of public welfare. Even now, there are such committed and corruption-free bureaucrats who are precise and clear on their agenda of development and have no room for vanity. To accomplish a task right from the ideation to implementation, a civil servant needs to spend considerable time on that project or within that department. However, this is not possible in most cases because of political interference which tends to remind any good administrator that the power of democratically elected offices surpasses every achievement of their own! We need a regulatory mechanism that could help our bureaucrats function effectively and perform their duty judiciously. The Maharashtra Government Servants Regulation of Transfers and Prevention of Delay in discharge of official Duty Act, 2005 is a step in a positive direction. The act states that all India service officers and all Groups A, B and C state government servants or employees, their normal tenure in a post shall be three years. Further, it says that no government servant shall ordinarily be transferred unless s/he has completed their posting tenure of three years. Finally, the importance and contribution of the civil servants in developing the nation is unparalleled. This contribution can only be well acknowledged when we allow them to exercise their role and responsibilities effectively. We need to step back and introspect on how efficiently we have been able to make systematic changes based on the 2004 P C Hota’s Committee report on civil services reform. We have managed to create a judicial system whose integrity is unquestionable and its contribution is given in the form of justice for the society. Can we allow the civil servants to function freely where they face fewer obstacles and deliver what is expected out them? This can be only done when individuals in the system are committed to development which works on ground and not on self-serving corrupt notions. Pankil Goswami is a programme officer with Public Affairs Centre-a not for profit think committed to good governance.